Navy Hospital Central Energy Plant B2270 Renovation - PRIME AE Group, Inc.
PRIME is responsible for mechanical and electrical engineering services and architecture for the renovation of the 1973 Central Energy Plant. The renovation includes increasing the plant cooling capacity by replacing a chiller, relocation of existing cooling towers, the addition of a new cooling tower, replacing exterior wall panels, interior remodeling of the control room, replacing electrical distribution equipment, and removal of abandoned equipment. Working in a hospital environment where 24-hour uninterrupted patient care is critical, the phasing of construction was significant to ensuring no major outages were experienced. Much of the electrical equipment being replaced was designed to be installed in the same location as the existing. 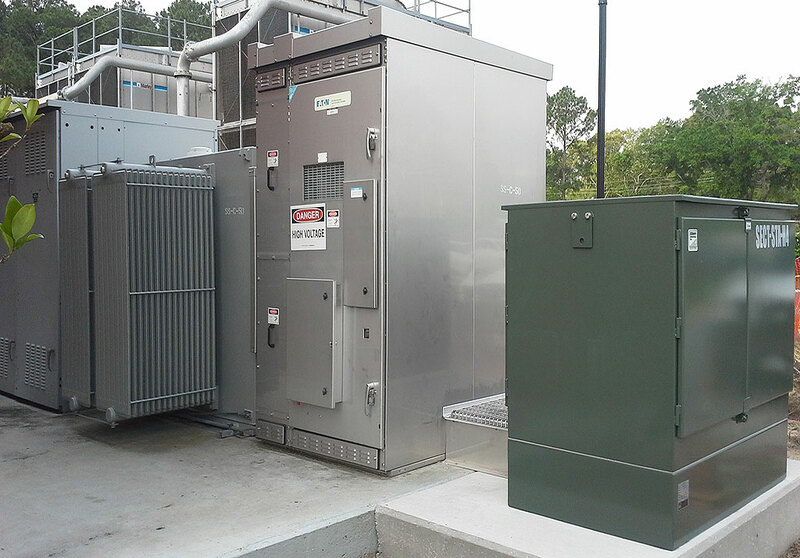 To maintain even minimal mechanical and electrical operation, our phasing plan required extending medium voltage power from a nearby switch to feed a temporary pad mounted transformer and 2,000 Amp Switchboard rated for exterior use. Once the new switchboard is installed, the loads will be transferred to permanent gear until the project is complete. The existing steam absorption chiller was replaced by a new 1,000-ton electrical centrifugal chiller. An associated 3,000-gpm cooling tower as well as new condenser water pumps were also installed. Additionally, underground condenser water pipes to the indoor chillers were abandoned and replaced with above ground piping. To keep the building operational, the new chiller and cooling tower were installed before relocating and refurbishing existing towers.